Home › General › Install System Centre Operations Manager 2012 R2 and the SQL Server Management Packs, configure a new dashboard. Install System Centre Operations Manager 2012 R2 and the SQL Server Management Packs, configure a new dashboard. The Microsoft Partner Network (MPN) provides licenses to run software, such as Windows Server and System Centre 2012 R2 Standard Edition (SCOM), to independent consultants. Membership entitles you to “internal-use software to run your business, develop applications, and test new solutions”. This article is basically a list of notes taken while learning and evaluating SCOM at home using the MPN software. A networked environment was constructed using 4 Virtual Machines (VM), each VM is running Windows Server 2012 R2 Standard Edition (WS2012). Install WS2012 on each server, promote 1 to a Domain Controller (DC), create domain XML400.dev01.net, enrol the other servers in the Domain. The firewalls on all servers were disabled, Routing and Remote Access was configured to allow all servers access to the internet. Install .NET 3.5 on all servers except the DC, from the command line. Additional features (HTTP) are also required on the application server hosting SCOM. Created an AD security Group ‘OMAdmins’ then created a Group Policy Object (GPO) that added the new group to the ‘Local Administrators’ group on all servers. Created AD users for the Operations Manager (OM) Agent Action Account and Data Access Service, added these to the ‘OMAdmins’ group, excessive permissions for the Data Access Service but suitable here. Installed SQL Server 2012 Standard Edition on the Application Server, SQL Server 2014 on the SQL Servers. Set SPN’s, add the ‘OMAdmins’ group to each instance as System Administrator (SA). Downloaded the ‘Report Viewer’ and ‘SQL CLR Data Types’ to the Application Server (SCOM pre-requisites). 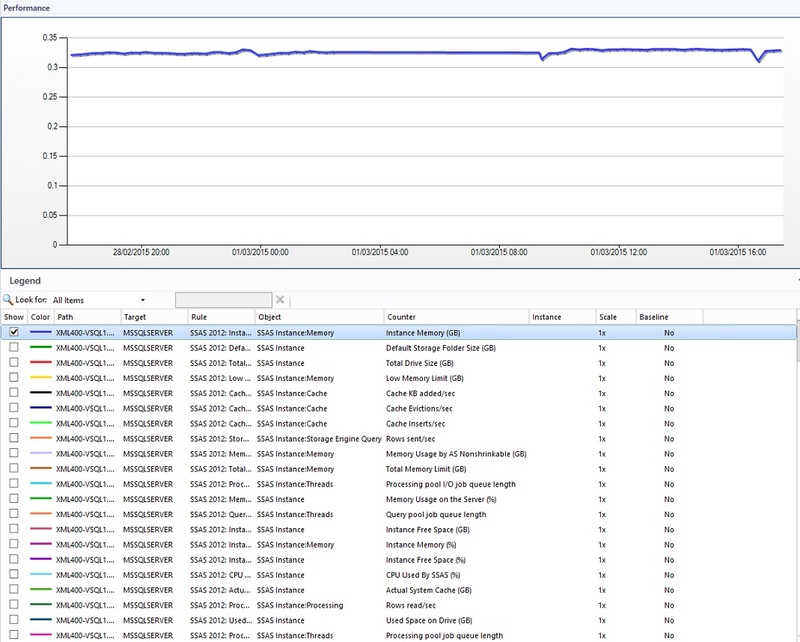 Installed System Centre 2012 R2, downloaded and imported the new SQL Server 2014 MP’s, deployed monitoring agents to the SQL Servers, enabled client monitoring. 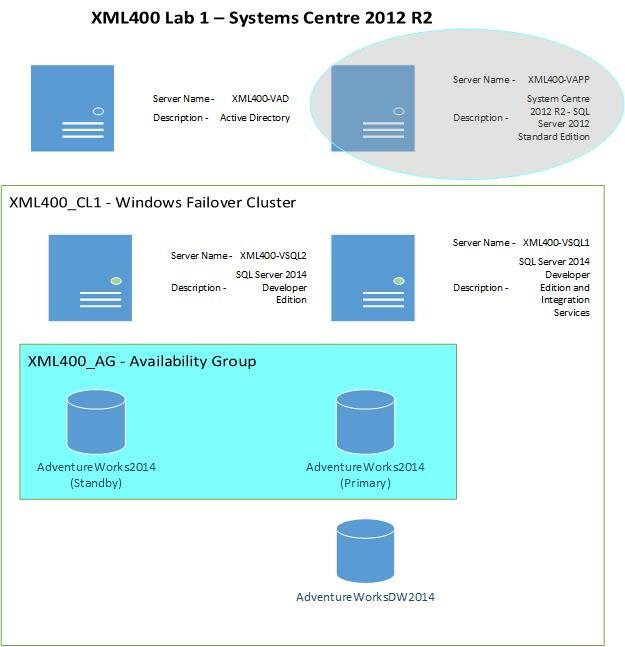 Configured a ‘Windows Failover Cluster’, created a SQL Server Availability Group (AG), backup/restore ‘AdventureWorks2014’ and added to the new AG. 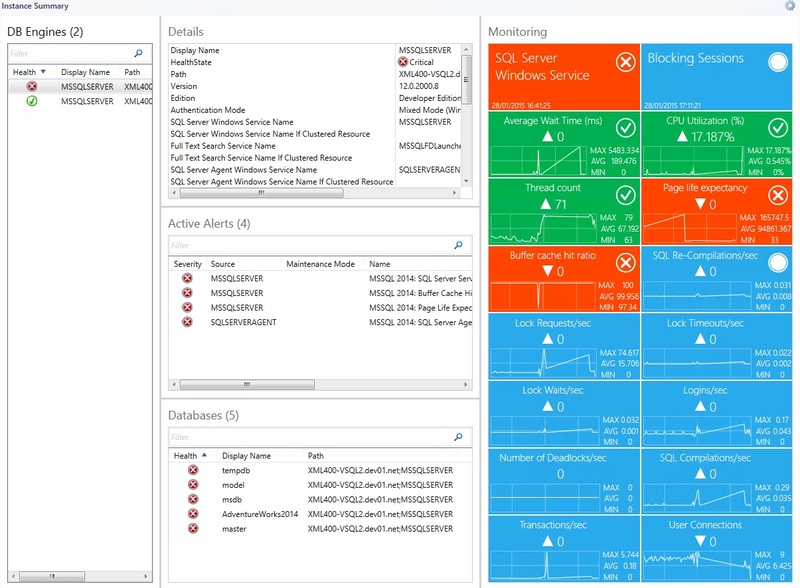 The SCOM Web and Management Console ‘Database Summary’ view from the SQL Server Management Pack. The SCOM Web and Management Console ‘SQL Instance Summary’ view, everything working. The SCOM Web and Management Console ‘SQL Instance Summary’ view, after the SQL Service on XML400-VSQL2 had been stopped. There are some great monitoring views delivered as part of the default SCOM MP’s are there are some great Widget’s you can use to create your own. Dashboards similar to the ‘SQL Summary Views’ shown above are easy to create for subsets or groups of SQL Servers. 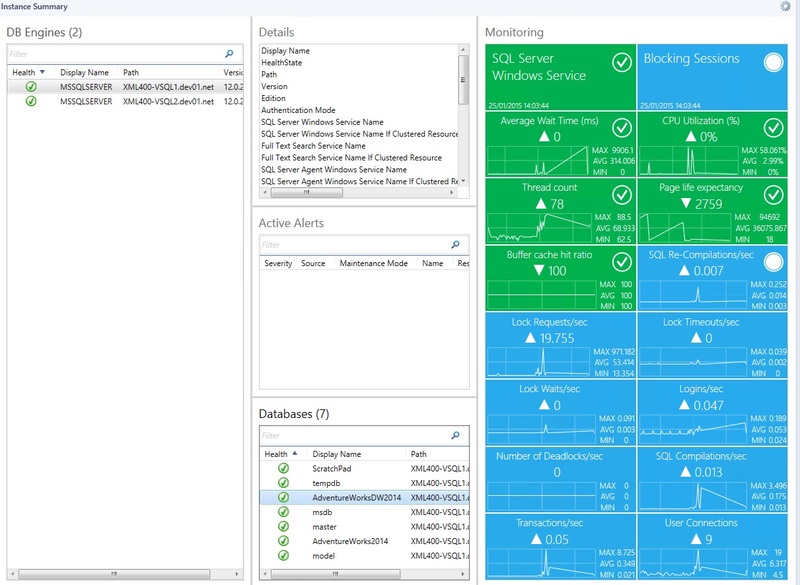 You can also create ‘Diagram Views’ to associated the objects related to a business service, which might include IIS and Applications Servers, the example below shows just the objects in the SQL Computers class in the evaluation lab. Analysis Services (SSAS) Monitoring and alerting is not included with the SQL Server MP’s, they can be downloaded separately. The screen shot below shows the SSAS MP Alert view in the evaluation lab. 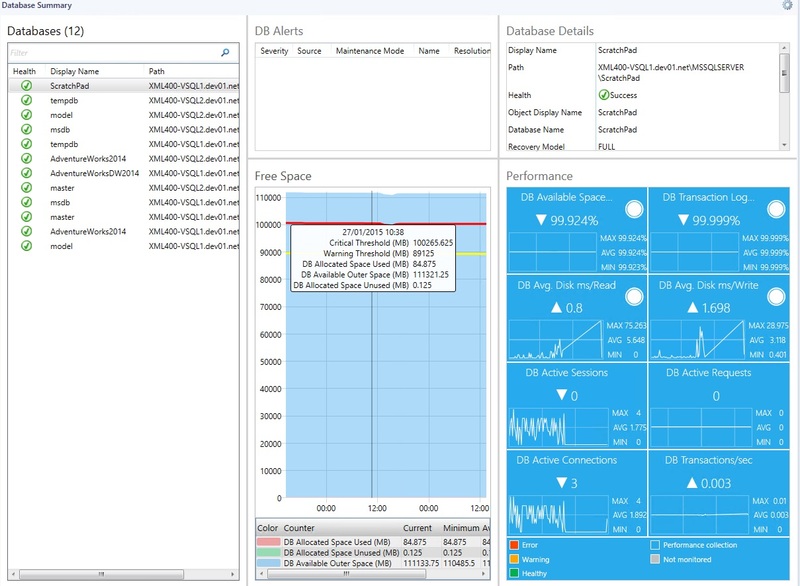 The screen below shows the SSAS performance view. In my opinion, these MP’s are well worth importing, the monitoring and alerting looks very good. Click here for a list showing the default thresholds for the monitors that are downloaded from the Microsoft website in sealed SQL Server MP’s, as at 2015/02/21. Click here for a list showing the default rules that are downloaded from the Microsoft website in sealed SQL Server MP’s, as at 2015/02/21.